When you’re planning a wedding day timeline, the best advice is let your vendors help you build your timeline, and add an extra 10 minutes to every task. Sometimes the simplest things can take an extra 10 minutes and then all of a sudden, the whole morning is thrown off. I have seen “getting the bride in her dress” take almost 40 minutes because of a button malfunction. It’s a smart idea to add in an extra ten minutes here and there so that you have some wiggle room to work with! This way, if one part of the day gets thrown off by 20 minutes, I can help you compensate that time in other areas. There are so many different things to think about when you’re planning a wedding day. I help all of my brides by building a timeline for the day, but if you are doing it on your own I want to help you! I realize that every single wedding day is different and so not all of these tips will apply to every wedding day schedule. Something else to consider is that not EVERYTHING will go as planned, and I promise you, that is completely normal!! If you want to remember all the small details you had the day of your wedding, make sure you provide them for me to shoot! I will typically ask for your flowers, shoes, jewelry, invitation suite, perfume, and BOTH rings. Yes, both rings I said! You will be wearing your rings for photos and I will need them for details so make sure you keep the groom’s ring the morning of, we will make sure we hand them over to the best man before the ceremony. If there is anything else you have that is special to you the day of, let me capture it! A grandmother’s ring, a piece of your mother’s wedding dress in yours, a pin with special meaning. All of these things make your wedding unique and I want to capture it all for you! Having the details at the ready will make these photos go much faster! You will need your Bouquet & Bouts for your First Look! Have the flowers delivered to the room where the bride is getting ready, and if you want your groom to have is boutonniere for the first look, make sure you have someone who can bring it to him AND pin it on him before. If you don’t want the boutonniere for the First Look, have them delivered with the rest of your flowers and make sure there is someone assigned to pin them onto the groomsmen and groom before the rest of the photos! **Don’t want bouts at all? You don’t have to! This is your wedding day and if you want big bouts, little bouts, no bouts that is all ok! Make sure you communicate with your HMUA (Hair and Makeup Artist) about exactly how many people will be needing their hair and makeup done the morning of, and what time you need to be ready for photos. This will help them plan their morning to make sure everyone is ready and if they will need to bring in extra help or not. Your bridesmaids will have a bit of extra time after you to finish getting ready, so make your hair and makeup a priority! I also stress making sure you get a firm yes or no from bridesmaids and the moms about getting hair and makeup done, so that the HMUA doesn’t need to try to squeeze and extra person in. Make sure all the guys arrive on time to a specified location, and bring their suits and all the extras; socks, shoes, cufflinks, pocket squares and anything else they have been given to wear that day. Encourage them to try on their suits as soon as they get them, so that there is time to fix any issues that may arise with sizing or missing items. Myself or my second shooter will typically take detail photos of the groom’s items and then some mock photos of him putting on his tie, jacket, shoes and opening any letters or gifts he receives that morning. If there is time and the guys are feeling up to it, we may take some photos of them hanging out the morning of as well! You get to decide who should be there when you put on your dress. When that time comes, I will ask you to get mostly into your dress (enough to be modest), and then I will place you in a well-lit area, typically by a window for you to get buttoned, zipped or corseted into your dress. You can have your maid of honor, personal attendant, parent or anyone you want help you with this. If you want to do a reveal with your bridesmaids after you’ve got the dress on, I can help create that moment too! Be sure to think about the travel time and TRAFFIC to and from your getting ready location and your venue! When I help you build a timeline, I account for travel time and will usually add that right into the schedule. Make sure you think about how you will travel around the day of, who will be driving or if you want to rent a bus to hop around with your whole wedding party! 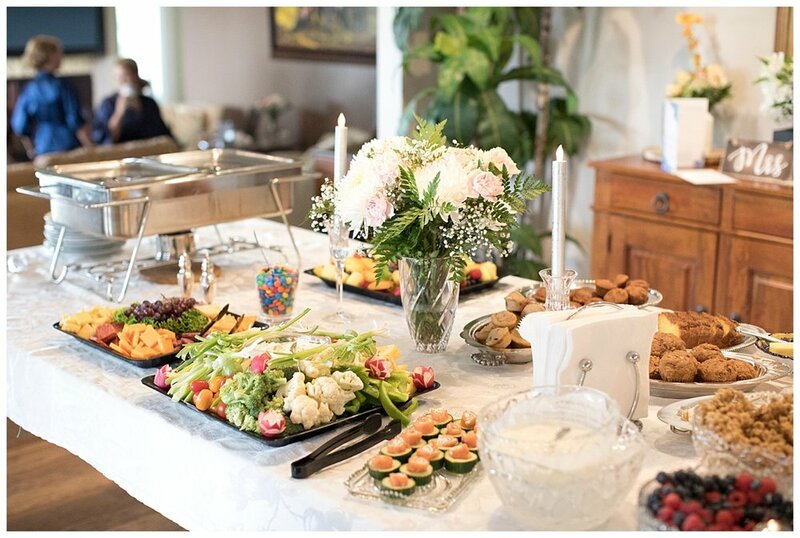 Make sure you schedule time between your getting ready breakfast and mimosas and your awesome reception dinner to eat something for lunch and drink water! I will typically wrap up photos an hour before the ceremony, giving you time to relax, touch of makeup and hair if needed and sit down, eat and drink some water! Most couples typically have a light lunch of sandwiches or salads, but you can make your lunch whatever you want. I’ve had couples order in pizza and pre-order meals from Applebee’s and have someone pick them up, just try to not get anything too messy! I do recommend trying to keep it light enough to fill you up, but heavy enough to help with any drinking you may be doing after the ceremony is over. Don’t worry, I won’t take photos of you eating unless you ask me to. RECEIVING LINE, USHER OUT OR NONE OF THE ABOVE? 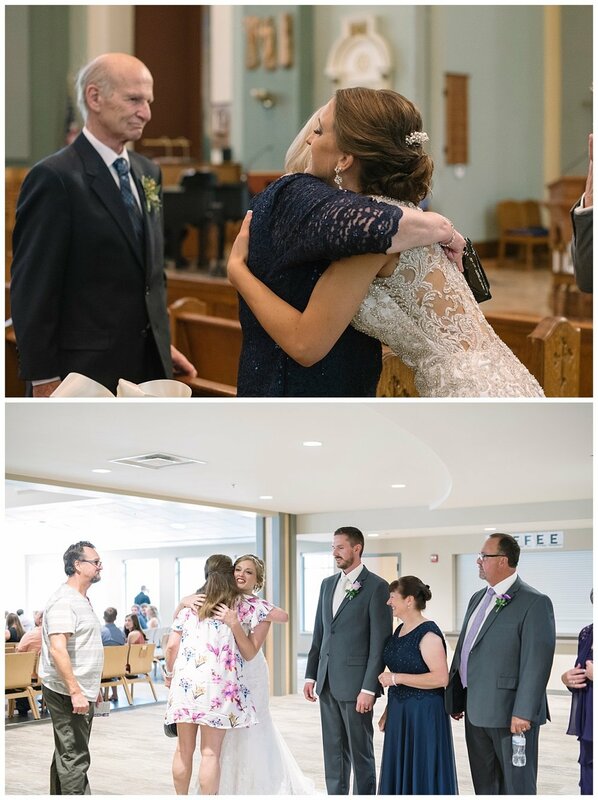 After your ceremony you have the choice of doing a receiving line, in which you stand at the back of the ceremony location and greet each person as they leave. This will typically take about 30-40 minutes depending on your guest count and if they like Midwestern small talk ;). You may also choose to usher your guests out. With this option, you will walk out of the church at the end of the ceremony and then circle back to the front and greet each person as they leave their seat. This will typically take 20-30 minutes, again depending on your guest count. If neither of these sound appealing, or if you just don’t like small talk, you aren’t required to do either! It is your day, so you can do what you wish. If you choose to not do a receiving line or usher out at the end of the ceremony, try to plan some time to visit as many tables as possible at the reception. It will be hard to catch everyone, but this will still make your guests feel welcomed and give them a chance to congratulate you. The ceremony is over; the party has already started! Now it’s time to get to your reception. Talk with your DJ about how you want to enter your reception and if you want to do anything fancy! Plan to have your party bus drop you off 20 minutes before you need to make you entrance. That will give you time to use the bathroom, get anything off the bus you need to and have your bridal party get lined up. This sounds easy enough, but when you’re hyped and ready to party it will take some time to get everything organized! The time it will take to serve your meal will heavily depend on the amount of guests you have and if you are doing seated or buffet. Seated will almost always take longer than buffet, but that doesn’t mean you should immediately rule it out! Go with the option you feel will be better for you and the experience you want to create. Before the day, make sure you talk with your venue staff, coordinator, and/or DJ and decide who will be dismissing tables for buffet. This will cut down on confusion the day of. If you choose to have a host & hostess dismiss tables, make sure they are aware of that the day of, and have them talk to the venue staff for tips about how to best keep the line moving and getting people fed. Typically you should not need longer than an hour and a half for dinner, and remember you can start your speeches and toasts while people are still eating! You will be the first table served, so the first ones done. Use this time to socialize with guests, take in the moment and get those toasts done. The more time you leave for people to wait for the next event to begin, the more likely you are to have people start to leave early. Keep them on their toes and in the moment! Again, talk to your DJ about your reception timeline and what you are wanting for events and how quickly things should happen. The part of the night will need to be a little flexible based on what’s happening and what the mood of the room is. Try to stop yourself a few times during the day and take a moment to soak it in. You’ve heard it a thousand times already; the day goes by so fast. You’ll be getting into your dress one moment and cutting your cake the next. The day is about capturing moment, being with the people you love and celebrating, but it’s also about you and your soon-to-be spouse and uniting into marriage. Take a second, stand back and look around and breathe. It’s a glorious day, so enjoy it!